Kids love to play dress-up, both boys and girls, and part of a really fun dress-up session is cosmetics, such as nail polish. That said, you don't want to paint your kid's nails with toxic goop, especially when little kids are known to stick their fingers in their mouths. 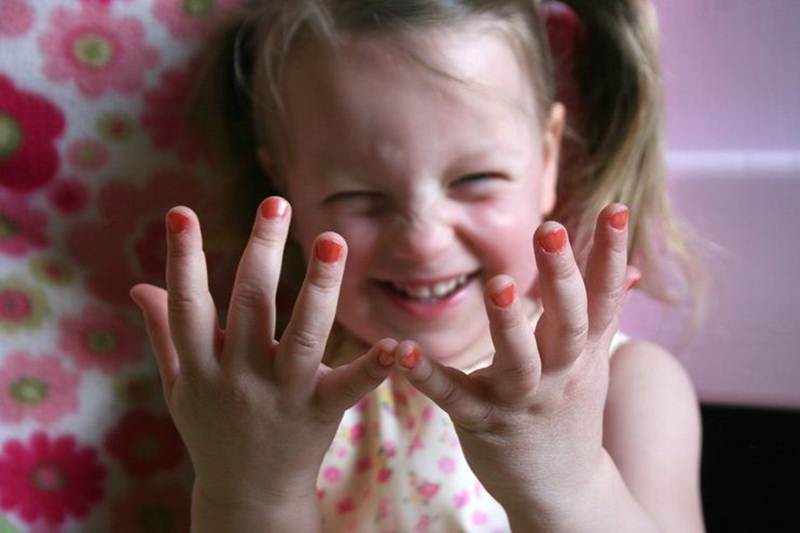 Luckily, many companies are making much safer nail polishes for kids. Nowadays you can choose from a rainbow of safer polishes that allow your kids to express their personality, without the toxic, harmful consequences of traditional nail colors. Read on to see our top safe-for-kids, nail polish picks that are perfect for Halloween or any time of year. Oh, and don't forget, pregnant mamas deserve a little primping too. Check out our favorite safe, less toxic nail colors for mamas-to-be. Hopscotch Kids WaterColors offer a slew of awesome perks. This company’s nail colors are vegan, cruelty-free, gluten free, fragrance free, paraben free, hypoallergenic and even biodegradable. Not to mention your child can choose from an array of cool color choices, such as Twinkle, Twinkle Little Star (sparkling silver), Ice Cream, Soda Pop (sparkling pink), Heads Up, Seven Up (shimmering light green), Miss Mary Mack (black with silver sparkles), Peter, Peter Pumpkin Eater (orange) and many more. Plus, now Hopscotch Kids offers an iridescent glittery top coat, to really make your child’s hands sparkle! Piggy Paint notes that they’re, “As safe as mud,” and that’s really true. Piggy Paint is specially formulated without harsh toxic chemicals, but dries to a nice durable finish. There’s no formaldehyde, toluene, phthalates, Bisphenol A, ethyl acetate or acetone in Piggy Paint. Piggy Paint is available in a wonderful array of colors, such as Matte Blue, Shimmery Yellow, Light Green Pearl, Midnight Black, Bright Red and many more. You should keep an eye out for their seasonal specials too, as they often lower prices on sets like Fall Colors and Christmas Color Packs. Additionally, check out their neon line of “Project Earth” nail polishes that are formulated in colors that will appeal to tweens versus little kids and their Refined line for mamas. Keeki Pure and Simple offers many safe cosmetic choices for young kids, some are even USDA organic. Kids will especially love their full line of non-toxic nail colors. Keeki Pure and Simple uses as many organic raw materials as possible in their products and their nail colors are free from parabens, phthalates and other toxic ingredients. Plus these nail polishes are gluten-free, toluene, vegan, made in the USA and never ever tested on animals. Keeki offers tons of color choices, but where they really shine is in their nail color gift sets. They offer amazing holiday nail color gift sets, school spirit gift sets, cupcake gift sets and more, all with color coordination your child will love. Priti Mini Flowers are sweet little bottles of nail color that are safe for your child. Each bottle of Priti Mini Polishes are completely non-toxic and free from the big bad three – toluene, formaldehyde and DBP’s. Best of all their range is wide, with many luscious colors to choose from, even some that mamas may like. Some color choices (with cool names) include Fairy Rose, Royale Robe, Fairy Thimbles, Moonstone Cactus, but there are many more to pick from. Willow Tree Minerals is a family owned company, making, among other natural cosmetics, an entire line of pretty, non-toxic nail polishes. Each bottle of water based polish is hypoallergenic, non-toxic, free of foul odors, toxic chemicals, formaldehyde, toluene and acetone. Polishes are also cruelty free ad packaged in bottles made from recycled glass. There are many awesome colors to choose from such as, dark raspberry, plum pink, light blue, iridescent pink and more. A Beautiful Life Nail Lacquer will appeal to older tweens and teens, with fresh shades like Juiced, Rock Star, Shroom, Frosh and more. But cool color choices don’t mean toxins. These polishes are free from the big three – DBP, toluene and formaldehyde. Plus, nail colors are long lasting, soy based and come in recyclable packaging. These are still super cool, but just much safer for your older child than typical polishes. Hopscotch Kids WaterColors offer a slew of awesome perks. This company's nail colors are vegan, cruelty-free, gluten free, fragrance free, paraben free, hypoallergenic and even biodegradable. Not to mention your child can choose from an array of cool color choices, such as Twinkle, Twinkle Little Star (sparkling silver), Ice Cream, Soda Pop (sparkling pink), Heads Up, Seven Up (shimmering light green), Miss Mary Mack (black with silver sparkles), Peter, Peter Pumpkin Eater (orange) and many more. 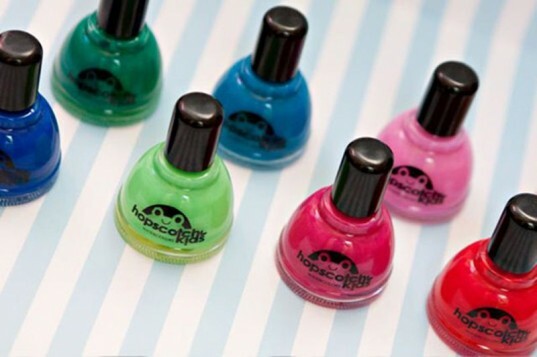 Plus, now Hopscotch Kids offers an iridescent glittery top coat, to really make your child's hands sparkle! Piggy Paint notes that they're, "As safe as mud," and that's really true. Piggy Paint is specially formulated without harsh toxic chemicals, but dries to a nice durable finish. There's no formaldehyde, toluene, phthalates, Bisphenol A, ethyl acetate or acetone in Piggy Paint. 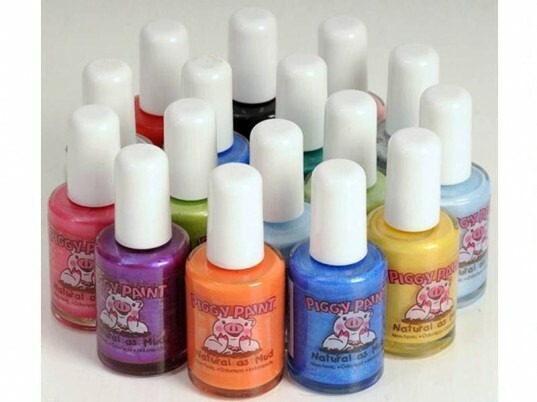 Piggy Paint is available in a wonderful array of colors, such as Matte Blue, Shimmery Yellow, Light Green Pearl, Midnight Black, Bright Red and many more. You should keep an eye out for their seasonal specials too, as they often lower prices on sets like Fall Colors and Christmas Color Packs. Additionally, check out their neon line of “Project Earth” nail polishes that are formulated in colors that will appeal to tweens versus little kids and their Refined line for mamas. Priti Mini Flowers are sweet little bottles of nail color that are safe for your child. Each bottle of Priti Mini Polishes are completely non-toxic and free from the big bad three - toluene, formaldehyde and DBP’s. Best of all their range is wide, with many luscious colors to choose from, even some that mamas may like. Some color choices (with cool names) include Fairy Rose, Royale Robe, Fairy Thimbles, Moonstone Cactus, but there are many more to pick from. A Beautiful Life Nail Lacquer will appeal to older tweens and teens, with fresh shades like Juiced, Rock Star, Shroom, Frosh and more. But cool color choices don't mean toxins. These polishes are free from the big three - DBP, toluene and formaldehyde. Plus, nail colors are long lasting, soy based and come in recyclable packaging. These are still super cool, but just much safer for your older child than typical polishes.